Published: Jan. 14, 2014 at 03:53 p.m. Updated: Jan. 14, 2014 at 04:07 p.m.
On Tuesday in Detroit, the message grew louder still. Coach-needy teams, like the Lions, are overwhelmingly favoring offensive-minded coaches to guide their teams out of the mire. Like last season, quarterback gurus are in high demand, from Jim Caldwell in the Motor City to Ken Whisenhunt in Rocky Top. In our nation's capital, Robert Griffin III has been paired with Jay Gruden while Tom Brady's former tutor, Bill O'Brien, has been tasked with fixing Houston's quarterback mess. Then there's the Browns, reportedly burning up to pair Johnny Football with Denver's Adam Gase or a coach-to-be-named. 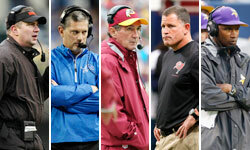 The influx comes just one season after seven of eight coach-needy clubs filled jobs with men known for their quarterback-whispering skills. Andy Reid, Chip Kelly, Marc Trestman, Mike McCoy, Doug Marrone, Bruce Arians -- even the fired Rob Chudzinski -- were brought aboard to create success on offense. Three of those men made the playoffs; two came within a game of doing the same. Yes, winning playoff teams last weekend ran the ball an average of 37.3 times, but the NFL's final eight passers -- Peyton Manning, Tom Brady, Russell Wilson, Colin Kaepernick, Drew Brees, Cam Newton, Philip Rivers and Andrew Luck -- tell the story: You're going nowhere without a legitimate force under center. Defensive-minded types with proven resumes -- like Lovie Smith -- will generate interest annually, but the current trend is fierce. If you can find a quarterback and make him go, you'll rise up the league's chain of command in a hurry.